Bed bugs can easily hide, evading housekeeping staff and even top pest control experts' best efforts. Management programs usually require several visits and all it takes is one newly introduced pregnant female bed bug or several missed eggs to restart the infestation cycle. In situations with regular turnover, rooms are constantly challenged with new bed bug introductions; these pests are notorious hitchhikers! And once an infestation establishes, these bugs are incredibly difficult to eradicate. That's why the country's top hotels are protecting their guests and beds with ActiveGuard® Mattress Liners. The only preventative tool in the nation developed and proven to kill both bed bugs and dust mites continuously for up to 2 years. 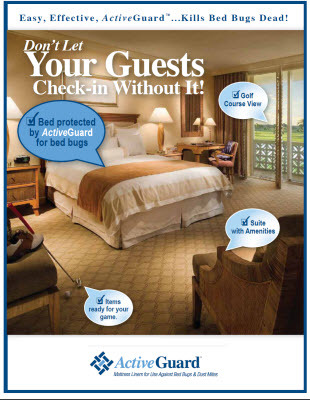 ActiveGuard® technology will actually kill newly introduced bed bugs, and significantly reduce the frequency of bed bug infestations occurring while protecting your bedding assets. EPA-registered for sale, ActiveGuard® reduces mattress dust mites and their allergens on a daily basis affording guests a hypoallergenic bedding environment. ActiveGuard® uses the same active ingredient found in children's lice shampoos, InsectShield® Repellent by L.L. Bean® and the U.S. Military combat uniforms for over 20 years. ActiveGuard® has been used in Europe and Asia for over 10 years; more than 100,000 have been sold worldwide. Patented technology that has been extensively researched with published data from both the lab and field. Fitted sheet style goes on easily with only a one person installation, 'Set it and Forget it'; ActiveGuard® requires no maintenance and is fire retardant. Effectiveness is not impacted by ripping and tearing, as compared to encasements. Damaged encasements need to be discarded, making box springs a perfect site for adding the protection of this technology. For difficult cases and the best preventative configuration, install ActiveGuard® on both mattress and box spring. Low carrying costs, just 4 sizes (King, Queen, Full/Double, Single/Twin) that fit extra length and deeply sized mattresses and box springs. Breathable, soft and comfortable; undetectable by the guest.